115 p., 15,5 x 23 cm. With contributions by Annette Dufner, Oliver Hallich, Rebekka Klein, Lars Leeten and Hans Ulrich Reck. The article argues that the doctrine of Gorgias of Leontinoi, as expressed in his ›Encomion of Helen‹, is not a rhetorical technique but a practice of moral education. The medium of this »ethical speech practice« is perceptual forms, its basic mode being the practice of showing or epideictic speech. The crucial standard of this practice is »epideictic rightness«, which is identical to Gorgias’ conception of »truth« (ἀλήθεια). According to this conception, speech is true if it exemplifies morally right conduct and moral beauty. True speech in this sense must also be effective speech, since it will promote right behaviour in the future. Oliver Hallich: Gibt es moralischen Zufall? The problem of moral luck relates to the question whether contingencies ought to influence our moral judgments. This article argues that while our moral assessments of agents ought to be independent from luck, there are strong non-moral reasons for letting contingencies influence the extent to which we expose agents to negative reactions. First, I offer an account of the problem of moral luck (1). Subsequently I argue that legitimate moral blame is immune from luck. Morally blaming an agent for unintended harm conflicts with the principle of the universalisability of moral judgments, and it rests on a confusion between evaluative and normative moral judgments (2). Nevertheless it can be rational to expose an agent who causes unintended harm to negative reactions (3). So there seems to be a tension between moral reasons and rational reasons. The (wrong) assumption that moral luck exists can be seen as resulting from the attempt to dissolve this tension (4). This paper points out a number of long-standing objections to Mill’s theory of the good and shows how exactly Sidgwick’s more detailed approach can avoid these pitfalls. In particular, critics have always insisted that (i) Mill’s »proof« of utilitarianism represents a naturalistic fallacy, and that (ii) his qualitative hedonism is inconsistent. Sidgwick’s »ideal element« of the good allows him to avoid these charges, and sheds new light on the assumption that the ›hedonism‹ of classical utilitarianism is a purely naturalistic concept. Instead, it has to be understood as a label for the modern, liberal notion of the individual good as opposed to the universal or utilitarian good. 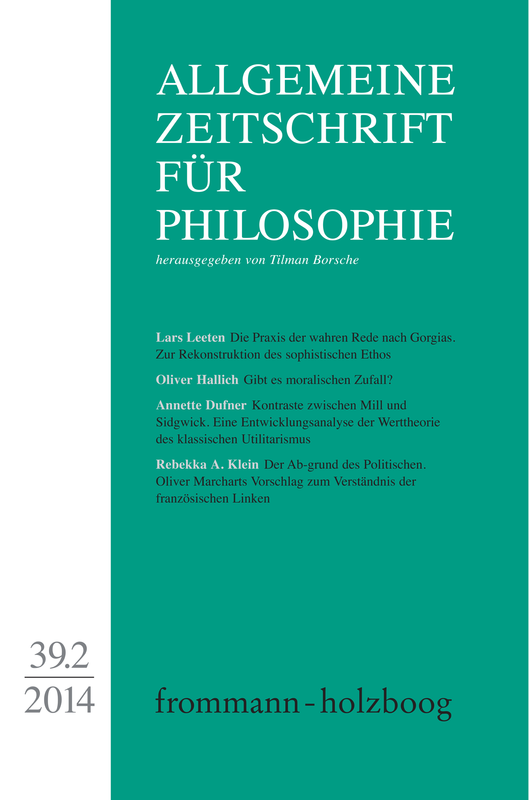 Oliver Marchart argues in his book on »Post-Foundational Political Thought« (2007), substantially expanded in its German version, »Die politische Differenz« (2010), that the leftist political project in contemporary French philosophy can be understood as an application of Heidegger’s critique of metaphysics to the field of political philosophy—from ontological to political difference. Marchart thus constructively reorganises a heterogeneous field of authors and concepts, bringing them together under one significant formula. This article tries to critically illuminate Marchart’s interpretation of Claude Lefort’s philosophy and his exclusion of Slavoj Žižek’s philosophy from the discourse of the French left.